Here is an interesting field surrounding M96. M95 is in the upper right while M105 is the elliptical on the left. NGC3384 is the furthest galaxy to the left and is cut off by the edge of the frame. NGC3373 is just below NGC3384. There are dozens of faint field galaxies in the image as well as over eight across the face of M96. 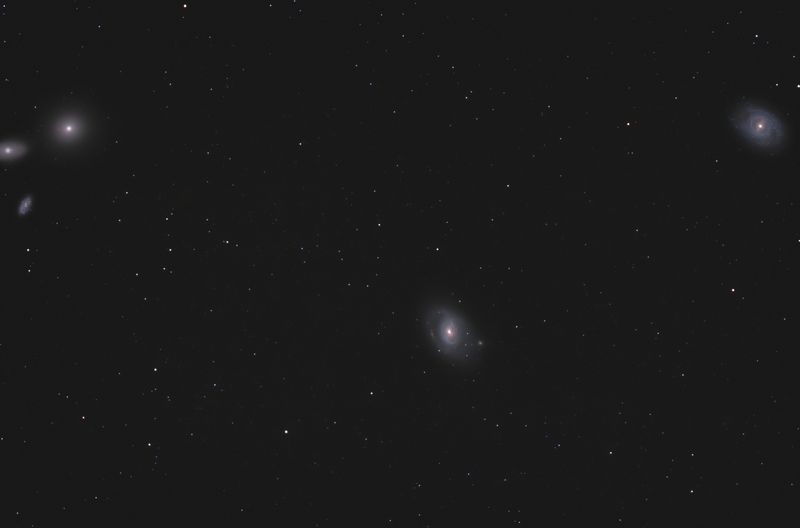 If you click on the image a zoom of M96 will show some more detail including a faint edge on spiral embedded in the left arm of the main galaxy. The image could use several times the exposure to bring out all the detail around M96 alone. Calibration, stacking, and all processing done in Images Plus . Split star processing with masked stretches used to bring out the galaxies.Masked noise reduction , sharpening and micro curves used to complete the image. Colour was enhanced by boosting the blue in the spiral arms and the red in the core of the main galaxies. Image binned and cropped for web display.